German jurist and statesman; born Nov. 10, 1810, at Königsberg, East Prussia; died at Berlin May 22, 1899. Educated at the universities of Königsberg (LL.D. 1829), Berlin, and Bonn, and at the Ecole de Droit, Paris, he became privat-docent at the university of his native town in 1831; he was appointed assistant professor in 1833 and professor of Roman law in 1836, serving also as judge. In 1846 he received the title of "Rat" at the higher court. He took an active part in the turbulent political life of his time, and in 1848 was sent as deputy from Königsberg to the National Congress of Frankfort. He was elected secretary of this body at its first meeting, later became its vice-president, and on Dec. 19 was chosen as president, in which office he showed great skill in controlling an assembly made up of men animated by vastly diverse political ideas. As president of the congress he was also chairman of the deputation selected to offer the crown of the German empire to King Frederick William IV. of Prussia. 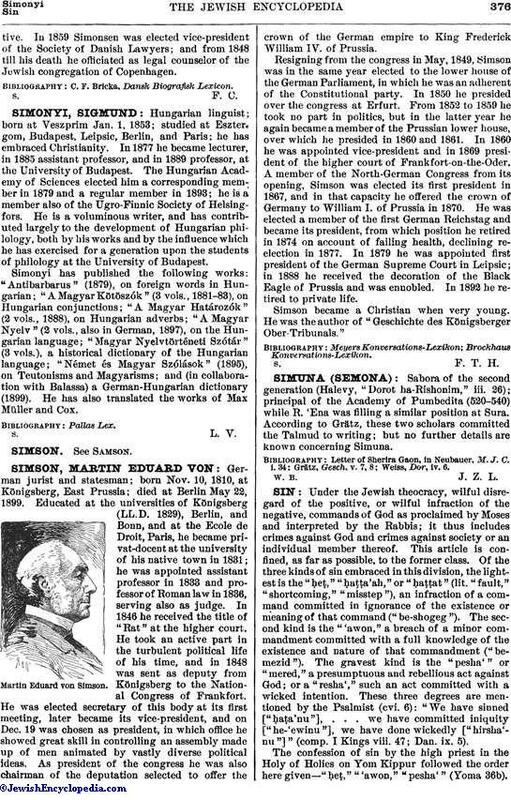 Resigning from the congress in May, 1849, Simson was in the same year elected to the lower house of the German Parliament, in which he was an adherent of the Constitutional party. In 1850 he presided over the congress at Erfurt. From 1852 to 1859 he took no part in politics, but in the latter year he again became a member of the Prussian lower house, over which he presided in 1860 and 1861. In 1860 he was appointed vice-president and in 1869 president of the higher court of Frankfort-on-the-Oder. A member of the North-German Congress from its opening, Simson was elected its first president in 1867, and in that capacity he offered the crown of Germany to William I. of Prussia in 1870. He was elected a member of the first German Reichstag and became its president, from which position he retired in 1874 on account of failing health, declining reelection in 1877. In 1879 he was appointed first president of the German Supreme Court in Leipsic; in 1888 he received the decoration of the Black Eagle of Prussia and was ennobled. In 1892 he retired to private life. Simson became a Christian when very young. He was the author of "Geschichte des Königsberger Ober-Tribunals."